Would you recommend other tests? Would an endocrinologist be a better option to check all bloods/vitamins/mineral levels? I went to see a celiac specialist on Thursday because it’s not letting up and his attitude was “what do you think I can do for you?” I showed him all my test results and he said 2 things. 1. Not celiac but perhaps gluten intolerance and 2. Psychosomatic follow on symptoms from the intolerance/allergy. He said you changed your diet, you felt better, you know what to do. This angered me because I was looking for reassurance that there’s not something else going on. It’s frustrating being native English speaking in a foreign country. If my German was better I would’ve had a good argument with him. My biopsy showed no villi damage with Marsh score 1. Lymphocytes 68/100. Iga bloods negative. There’s certainly some nervous system issues. For example when all the symptoms come on, I get speech issues like I’m drunk (slurred, weak voice). I even question if it is Celiac. Thanks! I don’t eat processed food nor gluten free labelled processed foods. I don’t understand why I felt good for one month, then suddenly on the same diet, I’m now having loose stools with indigested food and at times it’s green. Is arm and hand tingling/numbness normal? Also muscles in my back have this feeling like gas is blowing them up like a balloon. The nausea is also awful and it doesn’t help calm down my inner hypochondriac. It really is wearing down menatally. I can’t seem to get out the house for a walk. I just feel drained and really afraid. My feeling is in agreement with Cycling Lady, that getting glutened from your hair products is unlikely... but not impossible. I gave away some shampoo that contained wheat protein when I began with Gluten Free at a Celiac (zero tolerance) standard. It's not hard to find hair products that are labeled gluten free, it will just maybe take a bit for you to find something that you really like, labeled gluten free. Maybe your hairdresser could help you, with some samples? Or a little bit of a product in a little glass jar, labeled. Incidentally, I have always avoided hydrolyzed vegetable protein, it can be corn, soy, wheat, whatever. It is a potent source of Umami (kind of a zinginess) in processed foods. It's used as a substitute for MSG. Both MSG and hydrolyzed vegetable protein are big migraine triggers for me, and a lot of other people that are prone to migraines. I understand. I am 5’3” and 97 lbs. I feel like eating is a job! I get sick of having to eat so much! I even eat tons of gluten-free cupcakes, cakes and high calorie gluten-free Mexican food weekly! The weight loss has triggered severe headaches too which my neurologist worries about since I have had previous strokes. He says a severe headache or migraine can actually trigger another stroke. So he has me seeing the nutritionist weekly which has finally helped me maintain rather than the steady losing. The nutritionist has me using Benecalorie in my food. For people with malabsorption issues it is directly absorbed past the part of our damaged intestines where the celiac has caused us to have malabsorption issues. You can purchase it online. Just sprinkle it on your food. It comes in a completely tasteless powder form, or you can get liquid cups to just take on their own. Since starting the benecalorie i have at least pretty much stayed between 96-100 lb and have stopped losing as I previously was. It’s better to at least maintain than continue losing I suppose! Now I am starting to seriously pig out and hopefully I will actually put a little on! Hello welcome. All great advice from above posters. yep it's acid reflux is familiar to me. I had multiple intolerance s after diagnosis. My esophagus and stomach visually were a mess the gi scope biopsies showed inflammation of immune nature, but not marsh grade villi destruction. As I could only complete 6 consecutive days of my gluten challenge. For me my immune system attacks -everything !😳 All my organs felt inflammed. I believe my immune systems attacks my stomach, which affects my acid production, processing of food, and well if the stomach can't do its job right the rest of the tract also inflamed has additional burdens. I found Apple cider vinegar and fresh minced ginger was my friend in the beginning. I still do it now when I need it. I like Dr. Axe's formula. https://draxe.com/recipe/secret-detox-drink/ I blended My foods for several weeks as I had 13 intolerances, a ton of inflammation, my gallbladder was a trickle of bile, and My pancreas too inflamed to make enzymes properly. My inflamed stomach clearly couldn't product the right amount of HCL and damaged parietal cells likely not able to absorb many nutrients especially b12. My stomach cells I believe get damaged. I discovered with more recent c.c. Experiences reveal when the stomach gets inflamed I need to supplement b12 sublingually. As my typical supplement is not absorbed right when my stomach is inflamed . The sublingual b12 helps a bit with the bloat, but my body has to heal to really kick it. I take liquid vitamin d and liquid magnesium as well. I enjoy a good Epsom salt bath for comfort. As others says tons of water. I drink water keifer too. Dandelion tea is helpful as well. L-glycine may help healing. I also heard (never personally tried) aswaganda may benefit mood. I use tcm acupuncture as well to support my body. I have been seeing my chiropractic tcm Dr for years now. Who ironically is also a celiac. I am slowly getting down a routine here. I'd love to say I never get cc, but even at my strictest DH current best practices regime it still occasionally slips in. 😠 For my DH I use topical zinc oxide. I like the others above use many of the tricks and arsenal of tools that I pull out to support my body. I really hate being cc, and I'll admit it is one of the most challenging things emotionally I am learning to accept as this celiac life is showing me I can't control everything in my environment all the time. Gluten is everywhere. I wish it were not. I just am vigilant and avoid being reckless. No eating out. whole foods based diet as most gluten-free processed foods were revealed to be an issue for me. What is not Whole foods I make from scratch at home. Only a few certified gluten-free processed foods make the cut. In closing I swear once enough of the initial gluten was out of my system, I no joke slept a ton for 2 years, probably more than I have my whole life as My body needed to heal years of damage due to misdiagnosis. Your sis I'm sure will help you, but as you'll find most of us are different with many similarities. We have to tailor, our healthy daily routine and our healing routine over time for our unique selves. While my cousin is celiac we are not one size fits all, even with shared genetics. I can't have corn, corn dervatives, or cows milk. She avoids lactose milk products, but has no corn issues. Hope we have given you some helpful info and tricks of the healing trade. 👍 I like to verify I am living gluten-free current best practices. Thanks. I have a question about hydrolyzed vegetable protein in hair products. I’ve been using Redken All Soft conditioner for a long time, assuming it’s safe. I have long hair so I want to use gluten-free products because my hair gets in my mouth sometimes. But recently I read that hydrolyzed vegetable protein can come from wheat and that it should be avoided - and my conditioner contains this ingredient. Does anyone have any insight into this? 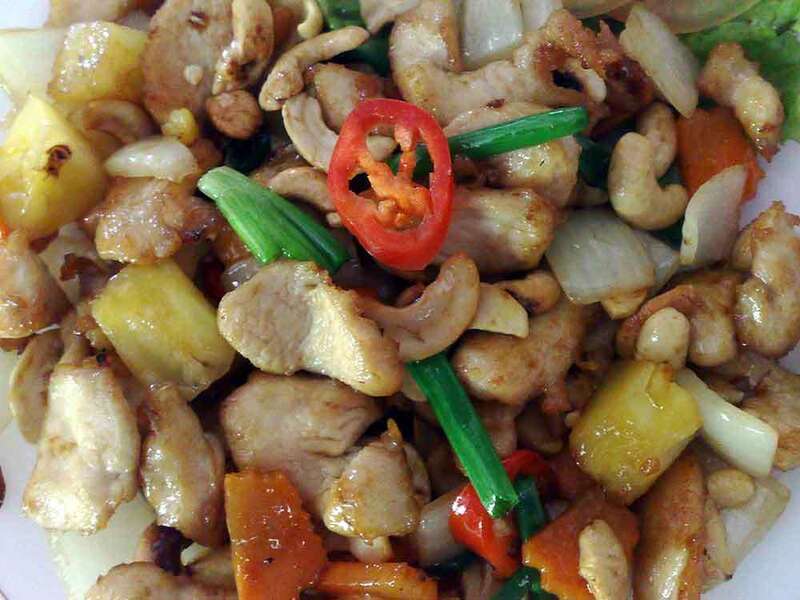 Celiac.com 04/20/2019 - Chicken with cashew nuts is an Asian restaurant favorite, with versions from China to Thailand and beyond. But, it's also a dish that so often contains gluten, and so must be avoided. This gluten-free version is a harmonious marriage of tender stir-fried chicken and roasted cashews in garlic sauce that will have you smiling. The key is gluten-free hoisin sauce, a dash of gluten-free soy sauce or tamari, and a bit of sesame oil at the end. Enjoy! Ingredients: ¾ cup roasted, unsalted cashews 1½ pounds boneless, skinless chicken breasts or tenderloins, cut into 1-1/2 inch pieces ½ teaspoon salt ¼ teaspoon freshly ground black pepper 2 tablespoons vegetable oil 6 medium garlic cloves, minced 8 scallions, white and green parts separated, cut into 1-inch pieces 1 white onion diced 1 cup diced pineapple 2 tablespoons rice vinegar 4 tablespoons Kikkoman Gluten Free hoisin sauce 1 tablespoon gluten-free soy sauce or tamari ¼ cup water ¼ teaspoon sesame oil Instructions: Heat oven to 350°F. Place the cashews on a large cast iron pan or a baking sheet in a single layer. Toast the cashews until fragrant, about 5 minutes. Remove cashews from the heat, and allow them to cool. Put the chicken pieces in a large bowl. Add salt and pepper and toss to coat evenly. In a large skillet, heat 1 tablespoon of the vegetable oil over high heat until very hot. Add half of the chicken to the skillet and cook, stirring, until lightly browned but not cooked through, about 3 minutes. Transfer to a plate. Add the remaining tablespoon vegetable oil to the skillet; then add remaining chicken, garlic, white onion, pineapple and white parts of the scallions. Stir-fry about 3 minutes, until the chicken is lightly browned, but not cooked through. Add the first batch of chicken back into the pan. Turn the heat down to medium and add the rice vinegar; cook until evaporated, about 30 seconds. Add the hoisin sauce, soy sauce and water, and cook, tossing, until the chicken is cooked through, about 1 minute. Remove from the heat. Stir in the scallion greens, cashews and sesame oil. Serve immediately with steamed white or brown rice.